A new MPR News-Humphrey Institute poll shows Democrat Mark Dayton and Republican Tom Emmer running neck and neck in the 2010 race for governor. Independence Party candidate Tom Horner trails Dayton and Emmer significantly, but with a little more than two months to go before Election Day, a lot of Minnesotans are still undecided. The poll shows Emmer and Dayton are deadlocked each with 34 percent support. Horner had 13 percent support. Pollsters interviewed 750 likely Minnesota voters last Wednesday through Sunday. The poll has a margin of sampling error of 5.3 percentage points. 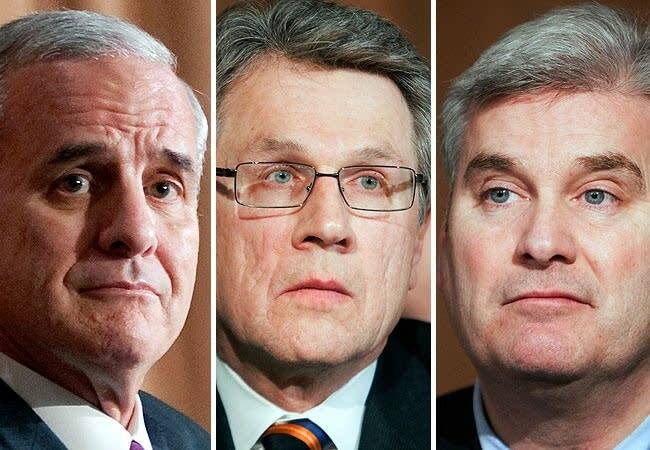 University of Minnesota political science professor Larry Jacobs, who oversaw the poll, said the results show Minnesota's 2010 governor's race is up for grabs. "Put simply, this race is wide open and any one of these three candidates could well emerge as the victor," he said. Nearly 20 percent of likely voters haven't decided or doesn't want to say who they're supporting. Jacobs said the poll also shows Dayton and Emmer are struggling to get members of their own parties to support them. "This is one of the most extraordinary results in the poll that we're finding about one-third of Democrats and particularly surprising, a third of Republicans not supporting their party's candidate," Jacobs said. "Usually you'll see maybe 20 or 25 percent of Democrats defect, particularly early on in a campaign. But it's very rare to see so many Republicans not rallying around their party's standard bearer." Which means many Democrats and Republicans appear to be waiting on the sidelines, possibly looking for an alternatives to Dayton and Emmer. At the Minnesota State Fair it quickly becomes clear Minnesotans have very different ideas about what they think government should be doing. Lynn Johnston, who was wearing a Tom Emmer campaign button, said she doesn't know all that much about Emmer apart from the fact he's the Republican. And that's enough for her. "I trust him more than anybody else that's on these tickets," Johnston said. Johnston said she hopes that if Emmer wins he will oppose legalized abortion and resist raising taxes. "He stands for most of the things that I want to see happen," she said. "We definitely need to spend less." The poll also shows 64 percent of likely Minnesota voters think the country is on the wrong track. More than half -- 53 percent -- think Minnesota is on the wrong track. Those who think the country is on the wrong track are more likely to support Emmer than Dayton. But those who think the state is on the wrong track are more likely to support Dayton than Emmer. The poll also shows a distinct income gap. Respondents making less than $50,000 a year support Dayton by more than a two-to-one margin -- 44 percent to 21 percent. For those making more than $50,000 Emmer is a clear favorite, 40 percent to 29 percent. Fair-goers Duane and Karen Fredrich of Robbinsdale said they were supporting Mark Dayton. Duane Fredrich said he thinks Dayton is a lot more solid than his detractors like to portray him. "Some people have labeled him as crazy and goofy," he said. "You know what, I don't believe any of that." Karen Fredrich says she thinks Dayton is trustworthy. "I don't think he's giving us double talk." And just as much as some Republicans think a tax increase isn't necessary, she thinks the state needs more money. "I think anyone who's running for governor or any state office right now who claims that we don't have to raise taxes is being naive," she said. Douglas Smart, of Bemidji, said he supported Tom Horner's Independence Party campaign, and that while many people might not know Horner now, it's early and Horner has time to win over independents, Republicans and Democrats. "I think he's got a real good shot if people just listen to him," Smart said. "Because he really makes sense when he's in a debate and he's down to earth and he's middle of the road, and that's what we need." But based on the poll, Horner has not yet made that case. Jacobs says there still is time for Horner to capitalize on concern about the other candidates. "You've got about a fifth of the electorate that hasn't made up its mind and those could well be folks taking a hard look at Tom Horner and also wondering if the other candidates are up to the task," he said. The primaries were a month early this year. Traditionally the general election campaign doesn't even begin until after Labor Day.